BirdLife Melbourne members who are looking forward to the 22 September Beginners Outing should take note that there has been a change in the meeting point. Due to the closure of Red Gums Picnic Area car park at Hawkstowe Park, members will now meet at 10.00am in the lower car park at Hawkstowe Picnic Area off Gordons Road. Mel 183 J7. Contact, Hazel 03 9876 3712 if you have any queries. Tess Kloot died on the 10th November 2016, just one day short of her 93rd birthday. In earlier days she was an active member of all three bird organisations centred in Melbourne – the RAOU/BA, BOC/BOCA and VORG. She was archivist for the RAOU in the 1970’s and then a library volunteer for BOCA and a member of its Publication Committee. In 2005 she received the BOCA Distinguished Service Award. Tess threw herself into all things ornithological, including the usual birdwatching activities. She contributed to bird surveys, e.g. The Atlas of Australian Birds conducted by the RAOU from 1977 – 1981, and she herself organised the VORG 1988 – 1991 survey on the birds of Box Hill. As part of her varied ornithological activities, Tess delved deeply into birds, books, biographies, bibliographies and history, reading and writing prolifically. Many of her articles appeared in The Bird Observer and VORG Notes. She was author or co-author of books and reports such as Birds of Australian Gardens (publ. Rigby 1980), Birds of Cranbourne Botanic Gardens (publ. 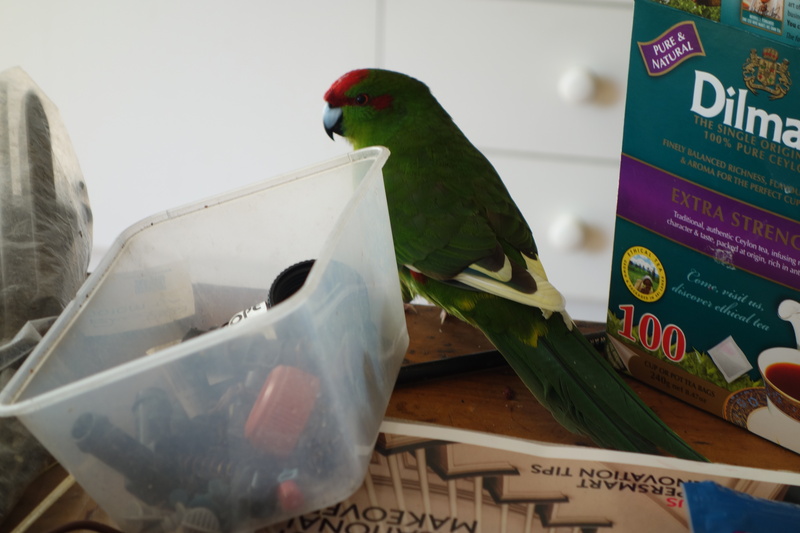 BOCA 1993), Birds of Box Hill (publ. VORG 2000) and was both the compiler and author of a large bio-bibliographical supplement (publ. BOCA 1995) to Whittell’s The Literature of Australian Birds, 1618 – 1950. Perhaps the greatest single task that Tess undertook was to collect first-hand information on the lives of all ornithologists connected with Australian birds. For these she used questionnaires, conducted personal interviews and corresponded widely. She gathered together 567 biographical files, 164 newspaper cuttings, c. 145 people photographs, and additional material on Tom Iredale and his wife Lillian Medland. In 2003 all this was accepted by the State Library of Victoria where it is stored as The Tess Kloot Collection (ref. no. PA 03/107) and may be consulted by those seeking relevant information. Sadly Peggy Mitchell passed away on 3 October 2016 at age 94 years. Peggy and her husband Hartley came to live in Mount Eliza in 1968 and immediately became involved with conservation of plants and wildlife on the Mornington Peninsula. She was a committed bird watcher, travelling the length and breadth of Australia in search of new birds for her list and her 600th tick was a Red-tailed Tropicbird at Esperance in Western Australia. This made her a member of ‘The 600 Club’, an exclusive club. She was a Life Member of BirdLife Australia/BOCA and was collater of the Unusual Sighting Reports, published in The Bird Observer, from 1984 until 2002, a mighty job. She was a member of the Peninsula Field Naturalists Club and coordinated their birding outings for many years. She and husband Hartley hosted the Field Naturalist committee meetings at their house and she was eventually made a Life Member of the Peninsula Field Naturalists Club. Peggy and Hartley were instrumental (with others) in saving the Langwarren Military Reserve from development in the 1980’s so it is now a great nature reserve full of wildflowers and birds. A wonderful character and we will miss her. We send our condolences to the family. On this mostly mild and calm, partly-sunny morning, the 13 participants who assembled at the usual meeting place at 10am managed wonderfully in my absence. A huge thank you to Denise for responding at short notice and collecting signatures, keeping the day well organised, and making clear and complete bird lists at each location. Further thanks to Arthur for providing excellent photos taken on the day. Welcome to the three newcomers and to one who made a return visit after about 16 years. Thanks also to all the regulars who always make the day so successful. Spring was certainly noticeable with such species as Horsfield’s and Shining Bronze-cuckoos being recorded in two places while Fan-tailed Cuckoos were at all places where the group stopped. Superb Fairy-wrens, Spotted Pardalotes, Red Wattlebirds, Grey Shrike-thrushes and Eastern Yellow Robins were also everywhere. Weebills, New Holland Honeyeaters and Brown-headed Honeyeaters were plentiful. Even Mistletoebirds were found in three places. In contrast, Purple-crowned Lorikeet was only recorded once, as were Kookaburra and Tree Martin. Surprising finds were Rainbow Bee-eater and Yellow-tufted Honeyeater. That was our first record of the latter. Yellow-tufted Honeyeaters occur in numbers at The Brisbane Ranges and would only have to fly 10 to 20 km to be in the You Yangs. The You Yangs area sits in a rain-shadow, largely due to the Brisbane Ranges blocking rain-bearing winds from the west. Brisbane Ranges habitat tends, therefore, to be wetter than that at the You Yangs. However, at present the You Yangs area is unusually green. The dams have water in them and some are dotted with clumps of white frog spawn. Pobblebonks, Spotted Marsh Frogs and Eastern Common Froglets share the soundscape at the dam above Fawcett’s gullly. Their calls are all quite different from one another, so are easy to distinguish. Another sign of spring is the flowers, including those of the boneseed itself, of course. In the afternoon of the visit, the group removed one and a half hours’ worth of these flowering plants from a dense growth to the south of our official site. The springtime yellow of the brightly blooming wattles remains. These include Golden, Gold Dust and Hedge Wattles. Elsewhere Dwarf Greenhoods are growing in places that are boneseed-free and usually quite dry. The last BirdLife You Yangs birding and boneseeding visit for the year is planned for Saturday 3 December. That will be the last time I organise and lead the outings for at least a year. One participant has offered to organise next year’s outings and she and others are prepared to lead one or more, so the project will continue. Is anyone able to help with identification?